Attacking the Congress, Prime Minister Narendra Modi on Saturday said unlike earlier times, there is no corruption in his government and every rupee meant for development is reaching the desired end.He said that after coming to power, the Bharatiya Janata Party (BJP) government ended the system of giving benefit of social schemes selectively to those who voted for a particular party, or those close to some politicians.Speaking at a rally here, Modi said more roads were constructed in Chhattisgarh in the last four years than built since Independence. "Wasn't there money available before? (Road Transport and Highways) Department before? Engineers before? And people's demand before? Yet it didn't happen. Why? "That's because, as one of the Congress Prime Ministers said, only 15 paise out of every rupee spent on development reached the villages," the Prime Minister said.Making a reference to Congress' election symbol, he said: "Which was this hand which made rupee to value only 15 paise? ""Today, the development is happening for one reason -- the same rupee, which then accounted for 15 paise worth of work, is today leading to 100 paise worth of work. That's why the work is now visible," Modi said.He added that while poor always demanded that they should be given homes and many political parties promised it during polls, this never happened. "There were big slogans about eliminating poverty. But did poor get homes? And even if they did, it were the peons of some big bureaucrat, or a servant of some politician," he said. 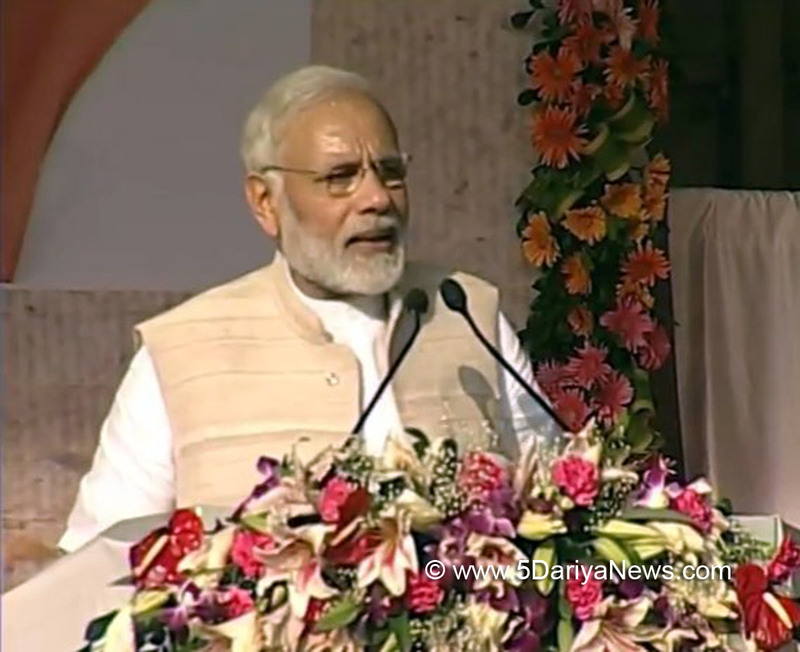 The Prime Minister added that his government changed the system and decided there will be no discrimination based on caste, religion or vote bank. "We decided that schemes will be made for all and they should benefit everyone. We decided that by 2022 -- which marks 75 years of Independence -- no family in India would be left without a home and the poorest of poor will have a roof over their heads...not just those who are thought of as a vote bank," he said.He said similarly, when the government decided to build toilets, they chose those villages where people voted for them. "But we decided that this won't work. If toilets will be built, they will be built for all. ""If rich families get LPG connection, then poor will get it, too. In four years, we gave as many LPG connections as earlier governments gave since Independence," Modi said.He said the government also decided to fulfil the long-time demand of farmers to get fair price for their produce. "For 60 years, they ran the government. But it was when our government came to power that we agreed to their demand and announced that farmers will get minimum support price one-and-a-half times their production cost," Modi said.He hailed Chief Minister Raman Singh for his initiatives to end the "menace of naxalism" and bringing development at the doorsteps of poor and tribal.